9 breathtaking Cross-Country Skiing Destinations you need to check out! Cross-country skiing is one of those iconic winter sports people can't get enough of. So if you have a Nordic skiing habit, if you start reading trail reports on September first, if you're dreaming about getting the original Scandinavian full body workout, you NEED to check out this list. There's something for everyone here, and each of these options is truly unique, but there's one thing they all have in common: they're some of the best cross-country skiing to be found in the United States. So wax your bottoms, grab your poles, and make sure the boots still fit, and get out there! Be sure to let us know what you think of these options, and let us know if we missed the mark at all or left out your favorites! Two roads diverge in a white wood, and you, you can take the one less traveled. This beautiful Green Mountain location offers not only trails for skiers of all skill levels, but a historic sense of place. Here, you can ski past Robert Frost's summer cabin where many of his illustrious poems were written, as well as the classically styled Breadloaf Inn, and a quintessential New England setting full of pine trees and stone walls. With over 45 miles of trails available for both Nordic skiing and ski skating, there might be more here than you can do in one day. Which isn't a problem, because each hut can be reached on the vast network of trails. Of course, "hut" might be a misnomer. Each location has a comfortably appointed main cabin where you can relax and enjoy a prepared meal, and bunkhouses that also offer deluxe private rooms. 3. Royal Gorge Resort, Soda Springs California. When it comes to finding places to ski, bigger is better. So the Royal Gorge might be the best, since it is the largest cross-country skiing area in North America. The resort has over 200 kilometers of groomed trails spread across 7,500 acres of pristine California wilderness that see an average annual snowfall of 500 inches. With slope-side accommodations available, you might just forget that there are ways to get around besides a pair of skis. It doesn't get any more rustic than this. Being dedicated to preserving the natural surroundings doesn't prevent the refurbished property from providing high end dining, spa treatments, and 100 kilometers of high altitude XC trails. If you're already a capable Nordic skier, the ranch also offers the chance to take aim with an air rifle if you want to try your hand at the other half of the Biathalon. 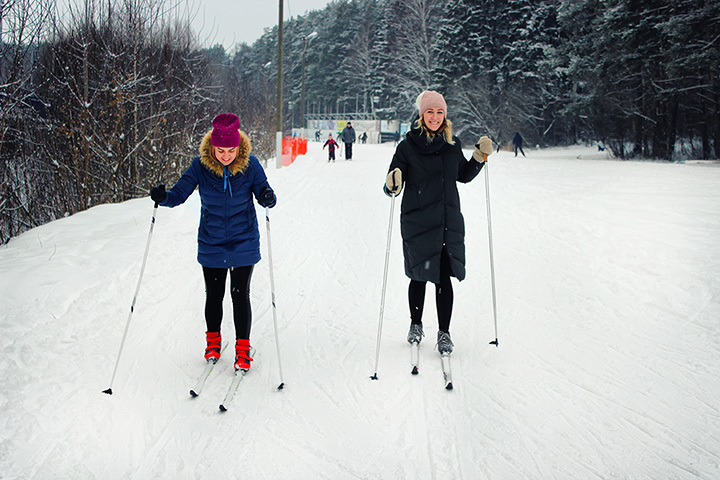 Cross-Country skiing isn't just for fun and exercise, it's also a way to travel. In the Methow Valley you can get a real feeling for how Scandinavians got around in the winter. The miles of trails across the four interconnected ski areas also provide access to businesses in towns scattered throughout the region. Over 50% of the trails pass through US Forestry Service owned land, so as you do a ski tour of the region's charming restaurants you can enjoy some of the most beautiful unblemished land in the Cascades. After leaving Austria, the von Trap family of The Sound of Music fame settled in the Green Mountains, which they said reminded them of their homeland. While enjoying the European style amenities of the lodge there's easy access to miles of trails, both groomed and ungroomed. Just don't expect to see any singing nuns during your stay. The 2002 Winter Olympics in Salt Lake City used Soldier Hollow as the location for all of the cross-country events, and since then the Hollow has also hosted a wide range of national and international cross-country competitions, but people come for more than just the world class skiing. Disney shot scenes for High School Musical 2 in the lodge, and a world unicycling competition has also been hosted here. Soldier Hollow also has extensive snow making, which means that the season here lasts as long as possible. While Jackson Hole is known primarily for its world famous downhill options, there are miles and miles of Nordic trails across the area. With long runs like the 27.7 mile RKO River Road situated in the breath taking Grand Teton national Forest you might want to just skip the long lift lines altogether to explore the rugged back country and the well maintained public trails. And at the end of the day you can still enjoy the Zagat rated accommodations, bars, and restaurants the region is famous for. While you won't find too many amenities here besides the ranger station, that's not really a drawback. In the winter you can use your cross-country skis explore the thousands of acres in this historic site where George Washington encamped the Continental Army during the darkest winter of the Revolution. A day out on the trails here will make you really appreciate your modern cold weather gear, as well as the obstacles that faced the creation of the United States.